It's time for Baby Hazel to go for a picnic with her beloved family. But picnic basket is not yet packed. Can you help Hazel to pack all the stuff required for picnicking as mom is busy feeding Matt? Then go along with Hazel and family to one of the most popular picnic spot in the town. 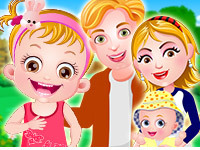 Enjoy a lot of fun-filled games and activities with them.